Our investment themes for 2012 are based on our economic, financial and political outlooks for this year as well as on our long-term forecast. After all, this year is just the first step in the long-run journey that will continue to be dominated by The Age of Deleveraging, as discussed in detail in our recent book with that title. This age, which began in 2007 and probably has another five to seven years to run, is dominated by the unwinding of the immense debt–built up by financial institutions globally starting in the 1970s, by U.S. consumers commencing in the early 1980s and, more recently, by governments as recession-weakened revenues and immense fiscal stimuli hyped their deficits and borrowing. This and eight other forces (Chart 1) are likely to hold U.S. real annual GDP growth in future years to 2%, compared to the zero growth since the fourth quarter 2007 business peak and the 3.7% annual growth in the 1982-2000 salad days. The 2007-2009 U.S. recession, the deepest since the 1930s, was the start of the worldwide deleveraging and the severe recession now unfolding in Europe is another important component. Like the U.S. Great Recession, the eurozone slump combines a financial crisis and a goods and services downturn. And it may be more severe in Europe where the eurozone, like the U.S., has a common currency and monetary policy but unlike America, lacks a common fiscal policy to deal with the mess. This year, we also look for a hard landing in China with real GDP growth dropping back to 5% to 6% annual rates, well below the 8% needed to provide jobs for new labor force entrants. We're also forecasting a moderate recession in the U.S. as consumers retreat from their recent spending strength that flies in the face of declining real incomes. In sum, we expect a global recession this year. A 2012 recession starting from a fourth quarter 2011 business peak would commence four years after the previous top in the fourth quarter of 2007. That would be a bit longer than normal for the secular downswing that we believe commenced in 2000. In the previous 1969-1982 downswing, complete business cycles averaged 3.7 years in length. 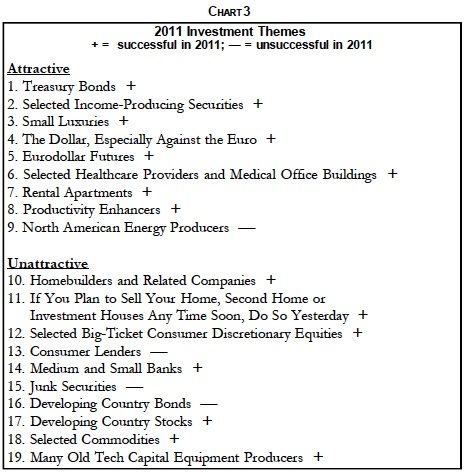 Our 2012 list of investment themes (Chart 2) is quite similar to our 2011 list (Chart 3) since most still appear valid. Last year, 15 of our themes proved correct and four were not. Treasury bonds were stellar performers, income-producing securities gained as did the stocks of small luxury companies. The dollar rose and Eurodollar futures had another outstanding year. The stocks of healthcare providers rose as did the prices of rental apartments. Productivity enhancers also had a good year. Among our unfavorable investment themes, homebuilders' stocks fell as did house prices. Big-ticket consumer discretionary equities fell as did bank stocks, developing country equities, commodity prices and the equities of many old tech capital equipment producers. Contrary to our expectations, the stocks of North American energy producers fell overall as a result of weakness in natural gas and coal producers. Consumer lender stocks rose, the reverse of our forecast, as did junk security prices and developing country bonds. This year, we've added two new themes: a favorable stance on consumer staples producers and an unattractive forecast for developed country stock markets. At the same time, we've had to say goodbye, sadly, to our long-time immense winner, Eurodollar futures. Earlier, the futures market did not price in the full extent of the Fed-engineered decline in short-term interest rates. 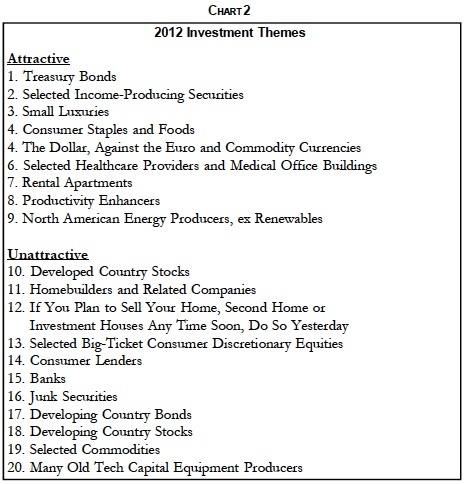 Here is an outline of our 20 investment themes for 2012. Subscribe to INSIGHT for the special introductory rate of $275 via e-mail, and you'll receive the full January 2012 report with all the details for each of the themes. –Because the likely price appreciation in Treasurys is in stark contrast to expensive stocks and overblown and vulnerable commodities, foreign currencies, junk securities and emerging market stocks and bonds. A year ago, we forecast a drop in the yield on the 30-year Treasury bond from the then-4.4% to 3%. The 3% yield was indeed reached and even breached in late 2011, providing a splendid 33% total return on a 30-year coupon-paying Treasury. We're now predicting a further decline to 2.5%, the low reached at the end of 2008 after Lehman's bankruptcy, because of the similar financial crises in Europe today and the possible spillover to the U.S. That further rate decline would produce a 10% total return in one year on a 30-year coupon Treasurys and 12% on a zero-coupon bond. We also expect the 10-year Treasury note yield to drop from the present 1.87% level to 1.5%, but the total return would only be 5.2%, largely due to its shorter maturity. The disdain among many investorsfor bonds, especially Treasurys, persists despite their vastly superior performance vs. stocks since the early 1980s. Starting then, a 25-year zero-coupon Treasury, rolled into another 25-year annually to maintain the maturity, beat the S&P 500, on a total return basis, by 9.2 times (Chart 4). This is one of our very favorite charts since we have actually participated in this marvelous Treasury bond rally as forecasters, portfolio managers and investors. 2. High-Quality Income-Producing Securities Continue to be Attractive. We continue to favor high-quality income-producing securities this year for several reasons. Many other investments such as stocks in general are unlikely to provide meaningful returns, especially on a risk-adjusted basis. Furthermore, after the bloodbath for almost all securities in 2008, many individual as well as institutional investors prefer highly-predictable cash returns here and now as opposed to pie-in-the-sky capital gains in the wild blue yonder. Treasury bonds are still attractive for appreciation, but with little appreciation likely elsewhere, investors will likely continue to seek meaningful interest and dividend payments. After a long hiatus, companies that pay substantial, predictable and increasing dividends may be coming back into style for two distinct reasons. First, in a post-Enron/Arthur Andersen world and after gigantic write-downs made reported earnings for many companies questionable, a company paying meaningful dividends is, in essence, assuring investors that it is generating the real earnings and real cash flow needed to finance those dividend checks. Furthermore, a significant dividend-payer will almost certainly continue to be run in a prudent and stable manner. Dividend cuts forced by the down phases of volatile earnings patterns are not loved by investors, as was shown when many financial institutions slashed or eliminated their dividend in 2008. Second, dividends may provide the lion's share of earnings for many companies in future years, as discussed in The Age of Deleveraging. Since the 2000 peak, the S&P 500 lost 18%, but was up 2% after accounting for dividends. We look for a return to the earlier floor of a 3% dividend yield on the S&P 500 from the recent 2.2% level even though that will put pressure on many companies to hike their dividends. The way the math works out, the dividend yield multiplied by the P/E equals the payout ratio, the percentage of after-tax profits paid in dividends. A dividend yield of 3% multiplied by the current P/E of 14.5 implies a payout ratio of 44% vs. 29% at present. That's a big jump, but would still be below the post-World War II average of 50%. Furthermore, a number of firms have plenty of free cash to hike their payouts substantially. Big banks' dividends will probably be limited by the Fed for some time. But meaningful dividend-payers among utilities, consumer product companies and healthcare firms may be attractive. Some have dividend yields that are significantly higher than their bond yields. Bear in mind, however, that substantial dividend yields do not consistently protect their payors' stocks for declines in overall bear markets. Our earlier study of sector stock performance in bear markets associated with recessions found that sometimes, but not always, equities in significant dividend-paying sectors resisted the general decline in stocks. 3. Small Luxuries Remain Attractive. Consumers, especially when they're hard-pressed as many are now, tend to buy the very best of what they can afford, even if it's within a low-priced category. We think manufacturers and retailers that can adapt to the demand for small luxuries will continue to be winners in the current environment. Some are adopting the small luxury mode by offering essentially the same products at lower prices by cutting their manufacturing costs. Last November, including the kickoff of the Christmas retailing season, U.S. consumers skimped on restaurant meals, groceries and building materials to buy electronic gadgets and other small luxuries. Champagne sales were probably up about 15% during the holiday season, but Emeric Sauty de Chalen, President of a French online wine store, is selling bubbly as a distraction from hard times rather than a celebration. Champagne "is a means to escape everyday life," he says. Another route to small luxury success is to continually introduce new and improved models that make their predecessors obsolete. Apple is the master at this strategy, and the iPhone made the cell phone in my jacket pocket utterly antediluvian and forced me to upgrade to an iPhone. Of course, the iPad positively reeks of small luxuriousness since it's too big for your pocket and is visible to all your friends. 4. 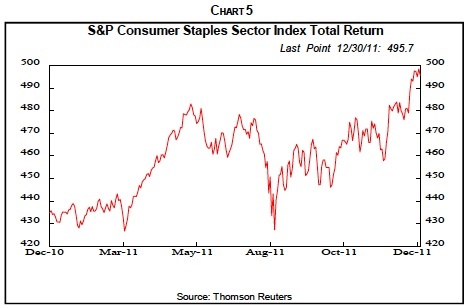 Consumer Staples and Foods May Be Attractive Relative to the Stock Market. The S&P Consumer Staples Sector Index's total return was up 14% last year (Chart 5) and is likely to do well this year, at least relative to stocks in general. Items like laundry detergent, bread and toothpaste are basic essentials of life that are purchased in good times and bad, and we believe their producers' equities will be attractive relative to stocks in general in 2012. So we're adding this as a new investment theme. Consumer downgrades are likely to continue while the weak economy and high unemployment persist. Proctor & Gamble, which prides itself on selling premium products at premium prices to cost-insensitive customers, has been induced to introduce Gain dish soap that is half the cost of its premium Dawn Hand Renewal. P&G has also seen the market shares of cheaper Luvs diapers and Gain detergent do better since the recession began than its high-priced Pampers and Tide. Among retailers of consumer staples, the winners may continue to be discounters, including dollar stores. American used-merchandise stores have been thriving. Producers of national brands will need to continue to adapt to consumer downgrading as weak incomes and high unemployment persist by emphasizing cheaper "value" products. 5. The Dollar Should Continue to Appreciate, Especially Against the Euro But Also Against Commodity Currencies Like the Australian and Canadian Dollars as Well as the Mexican Peso. Last year, the greenback fell against the euro early in the year but then rallied sharply, starting in August, as the unfolding financial crisis and impending recession in the eurozone drove hot and cold money to the safety of the buck. On balance, the dollar rose 3% vs. the euro. The dollar index, with a 58% euro weight, was up 2%. With similar patterns, the U.S. dollar rose 0.2% against the Australian dollar and 2% vs. the Canadian dollar but jumped 13% compared to the peso. The dollar in the long run is likely to remain the world's primary international trading and reserve currency because of rapid growth in the U.S. economy and in GDP per capita, promoted by robust productivity growth. Furthermore, the U.S. has the world's biggest economy and its financial markets are broad, deep and open. There are also no substitutes for the buck in the foreseeable future. And the dollar, despite the recent downgrade of Treasurys by Standard & Poor's, retains considerable credibility. In addition to these long-run factors, the greenback is the global safe haven in the current worldwide sea of trouble. We continue to note that the U.S. economy, fiscal policy and financial markets aren't all that attractive, but they're a lot better than the alternatives. 6. Selected Healthcare Providers and Medical Office Buildings Remain Attractive. Last year, the Dow Jones Select Health Care Providers Index rose 10%. Health care is a huge sector, accounting for 17.6% of GDP and growing rapidly. Two major features of the current system almost guarantee explosive growth. First, most Americans don't pay directly for their health care, which is primarily financed by employer-sponsored insurance or the government through Medicare and Medicaid. Second, in pay-for-service plans, medical providers have many incentives to perform extra work because more office visits and procedures enhance their incomes. Defensive medicine involving more procedures is also encouraged to avoid litigation over real or alleged mistakes. In addition, the demand for medical services in the U.S. will mushroom over coming decades due to several factors including, among others, an aging population; technological advances that are driving patient demand for more medical services; 32 million more Americans being covered by health insurance under the new healthcare law; more healthcare jobs; and cost control pressures. We also favor investments in medical office buildings (MOBs) that these increases and shifts in demand will require. This includes related outpatient facilities such as ambulatory care facilities, surgery centers, ambulatory surgical centers, and outpatient cancer and wellness centers. MOB demand is forecast to expand 19% by 2019, 11% of it due to the new law and the rest from population growth. The 64 million square feet are required to meet the demand of the new law and compares with a 2010 build of 7 million square feet. MOBs are much less volatile than other commercial and residential real estate, as shown by more stable vacancy and cap rates. They will not be plagued in future years by persistent excess capacity, which hinders new construction, as is the case with residential real estate, malls and office buildings. 7. Rental Apartments Are Still Attractive, and last year our index of apartment REITs gained 14%. This year we look for further gains in rental apartment prices and securities related to them. Rental apartments will continue to benefit from the separation that Americans are beginning to make between their abodes and their investments. The two used to be combined in owner-occupied houses back when owners believed house prices never fall, and they hadn't since the 1930s. So they bought the biggest homes they could finance. The collapse in house prices has shown them otherwise. A further 20% weakness in the prices of single-family houses due to the depressing effects of excess inventories will add fat to the fire. It will take a surprisingly small shift in housing patterns to make a big difference in the demand for and construction of rental apartments. Today, there are 114 million housing units in the U.S., of which 38 million are rented. If only one percent of total households decided to move to rented units, the demand for rentals would increase by over one million, most of which would need to be newly built apartments, after current vacancies are absorbed. This is a big number compared to new apartment starts of 333,000 on average over the past 10 years. To put it another way, each 1% decline in the homeownership rate increases rentals by more than one million, to the extent those ex-homeowners don't double up. Rental apartments will also appeal to the growing number of postwar babies as they retire, downsize and want less responsibility and more leisure time. 8. Productivity Enhancers Remain Attractive. 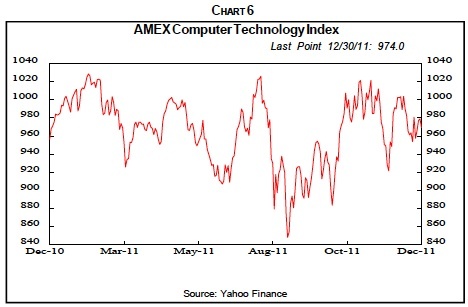 Last year, the AMEX Computer Technology Index rose 2% (Chart 6). We look for further growth this year in these and other productivity enhancers as business pressure to cut costs persists. In the ongoing slow economic growth and deflationary environment, increased profits through price and volume increases is difficult, if not impossible, for many firms. So the current cost-cutting zeal will remain in place. Labor cost-cutting has been in vogue in recent years, but does have its limits. So anything–high tech, low tech, no tech–that helps customers reduce costs and promote productivity will be in demand. 9. We Still Favor North American Energy, even though the companies involved had mixed stock performances last year, with a 3% decline in the Dow Jones US Select Oil and Exploration Index. With cheap natural gas and rising pollution problems, coal producers were down in the 50% range. As you might expect, natural gas producers' stocks were down with falling gas prices, but pipelines, in growing demand, were up. Domestic oil producers fared well but oil sands operators had mixed performances. Energy services stocks fell. Nevertheless, we remain fans of conventional North American energy because of the national resolve to reduce imports from unreliable foreign sources. Our favorites include natural gas producers, pipelines, oil sands, energy services, oil producers, nuclear energy, shale oil and gas, and maybe even coal. At the same time, we remain skeptical of ethanol, biofuels, wind, solar, geothermal, electric vehicles and other renewable energy activities because of their continuing heavy dependence on government subsidies. The recent bankruptcies of 10 solar panel producers make this point clear. 10. Major Country Stock Markets Appear Unfavorable in 2012. This new theme reflects our forecast of a major recession in the eurozone and the U.K., a hard landing in China and at least a moderate recession in the U.S., all culminating in a turndown in global economic activity accompanied by financial crises of unknown depth. Reinforcing this conviction is our belief that the U.S. and other developed economies are in a secular downswing that started in 2000, which is accompanied by a secular bear market in equities. These periods of more frequent, deeper recessions are mirrored by more frequent deeper cyclical bear markets in stocks. As noted earlier, since the peak in 2000 until late Dec. 2011, the S&P 500 index has fallen 17% and is only up 3% when dividends are included. We estimate that S&P 500 operating earnings will be $80 next year and that the P/E will drop to 10 in the global recessionary climate. So the S&P 500 index will fall to 800, we believe, a 36% decline from its 1,257 level at the end of 2011. Few agree with these forecasts. Bottom-up Wall Street analysts, who estimate earnings company-by-company and are congenitally optimistic since they want to please the managements of the companies they follow, see 2012 operating earnings at $106.81, a 10.0% jump from the $97.05 they expect for 2011. Even more sober top-down strategists expect a 6.6% rise from $98.90 to $105.38. And most Wall Street wizards believe the current P/E is on the low side, suggesting even more robust expectations for stock prices. 11. Home Builders and Related Companies Remain Unattractive. Last year, the Dow Jones US Select Home Construction Index dropped 9%. It may drop even more this year with our forecast of a further decline in median single-family house prices over the next several years, as excess inventories work their woes. True, new construction is now so low that it can't drop much further and some single-family home builders are turning their attention to the attractive apartment construction market. Nevertheless, the looming resumption of foreclosure and other distressed sales will depress prices below most home builders' costs, killing their sales and forcing them to take big writedowns on inventories of houses and, especially, land. Since building costs don't change much over time, the volatility of house prices is really the magnified volatility of the cost of the land they sit on. Conditions now are far different than when home building was a growth industry in the salad days of low mortgage rates, lax underwriting standards, securitization of mortgages that passed seemingly creditworthy but in reality toxic assets on to unsuspecting buyers, laissez-faire regulation, and, most of all, conviction that house prices never fall. Now all these conditions have reversed with lending standards tighter, on balance, in part because lenders are being forced to take back bad mortgages. Furthermore, the securitization of mortgages is essentially dead, with government agencies the only buyers. They now provide about 90% of new residential financing. 12. If You Plan to Sell Your House, Second Home or Investment Houses Any Time Soon, Do So Yesterday. If we're right and house prices have another 20% to fall over the next several years after already declining 33% for a total drop of 46%, this approach is obvious. Sure, it's tempting to believe that all real estate is local and the only three important factors are location, location, location. But as the decline so far has demonstrated, prices can and have fallen nationwide for the first time since the 1930s. Almost no place in the U.S. was exempt from the sell-off. 13. Many Big-Ticket Consumer Discretionary Companies Remain Unfavorable. Last year, our index, which contains cruise lines, auto producers, high-end consumer electronics, recreational vehicles and resorts and casinos but not airlines, fell 12%. The NYSE Arca Airline Index dropped 31%. We look for more of the same this year as consumers retrench after their Christmas shopping spree. 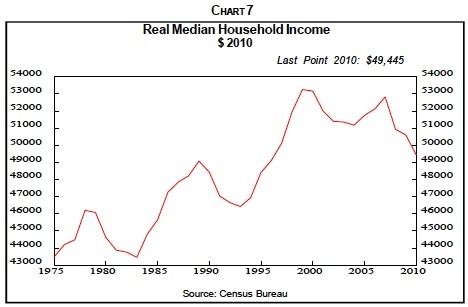 They have to, with real incomes falling (Chart 7). Otherwise, their elevated debt level will rise and the recently-depressed saving rate will fall further. 14. Consumer Lenders Still Look Unattractive even though their stocks rose last year as they benefited from faster consumer spending and more credit card transactions. The consumer retrenchment and global recession we foresee this year, however, should easily reverse those effects. Developments in the past several years are virtually all negative for the credit card business now and will be for years to come. Horror stories abound of people with $20,000 annual incomes who managed to run up $50,000 in credit card debt and then became unemployed. The cottage industry to help these people deal with their financial woes exploded in size, and we're all bombarded with TV ads for those services. Cash and debit cards are replacing credit cards as consumers realize they can't trust themselves to restrain debt and need to accumulate the money in a bank account before spending it. Layaway plans are replacing the buy now, pay later approach. With the switch from a quarter-century-long consumer borrowing-and-spending binge to a long-run saving spree, the credit card business has moved from a growth industry to a laggard. 15. Banks Remain Unattractive. Deleveraging and the carryover from past financial woes continue to plague major U.S. banks and financial service institutions, with the Dow Jones US Select Financial Sector Index falling 20%. Regional banks on the Dow Jones US Select Regional Bank Index dropped 12%. We expect further weakness this year as deleveraging and writedowns persist in a recessionary climate. European banks are in much worse shape, plagued by subprime sovereign debt holdings much as U.S. banks in 2007-2009 were sunk by subprime mortgage assets. As with major U.S. banks back then, bailouts of major European banks seem inevitable, and is already the de facto case with many relying also entirely on the European Central Bank for funding. Stringent, probably excessive regulation in and beyond the new financial reform bill is replacing the laissez faire model. The Fed's bank supervisors have switched from saying yes to almost anything the banks want to do to saying no. Higher capital requirements and other limits on risk taking will curb bank profitability. So will the limits on executive pay aimed at reducing the incentive to take big risks, especially after the recent flurry of big bonuses. Big banks are also being forced to delever and exit profitable businesses that lie outside traditional low-risk and low profit commercial banking activities such as spread lending. They're being bereaved of off-balance sheet vehicles, proprietary trading and other much more lucrative activities. Although the "Volcker Rule" prohibiting banks from trading for their own accounts has not been fleshed out by regulators, many financial institutions are already taking action to limit or eliminate proprietary trading. They include JP Morgan, Credit Suisse and Goldman Sachs. Big banks are also forced to repurchase flawed mortgages. U.S. banks have considerable exposure to the continuing eurozone crisis. Profit gains from reducing loan loss reserves and selling non-core assets are probably about over. The restrictions on credit and debit card charges will eat into profits. In the go-go days, many smaller banks were unwilling to virtually abandon their underwriting standards to compete with nonbank residential mortgage lenders. So they lent to the commercial real estate market instead, often residential construction-related firms that went bust. And they suffered from the housing collapse. Due to these bad commercial as well as troubled direct residential real estate loans, many smaller banks remain in difficulty. Individually, they aren't too big to fail, but collectively they are since smaller banks are the primary financers of smaller businesses. Those businesses don't have access to commercial paper and other credit market vehicles and must rely on their local banks for loans, often backed by the home equity of their owner, if they have any, or on their personal credit cards. 16. Junk Securities Remain Vulnerable, even though they rose 6% in price last year. In the ongoing zero interest rate world, investors rushed to junk securities in their zeal for higher yields. That drove the spread between junk bonds and Treasurys from its 20 percentage point peak in December 2008 almost back to the previous low of June 2007. In 2009, junk bonds' appreciation and interest returns combined were 57.3% with a further 15.3% gain in 2010. As in earlier boom times, investor zeal made refinancing sub-investment-grade securities easy, so defaults in the first half of 2011, at 0.2%, were also near record lows. Refinancing money was so readily available that defaulting on junk securities took real skill! 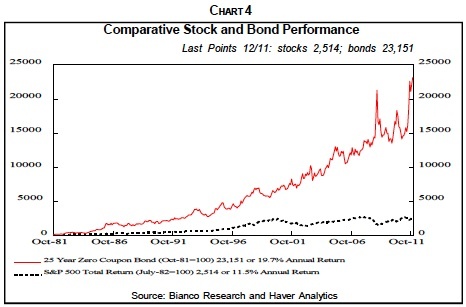 We've always felt that junk bonds are essentially stocks. Real, for-sure bonds are backed by so much corporate cash flow that the prospects of interest payments not being met are extremely low. Only with fallen angels destined for bankruptcy do investors worry about getting their semiannual interest checks. By contrast, junk bond price levels and likelihood of meeting interest payments depend primarily on companies' quarter-by-quarter earnings and cash flow. That's no different than what principally determines stock prices and dividends. Sure, stock bulls point out the prospects for growing earnings and stock appreciation, which isn't the case with bonds unless interest rates decline. Still, in the slow growth, deflationary world we foresee, growth in earnings and stock prices will be limited, hardly enough to give equities a clear advantage. So let's look at junk bonds as low-quality equities with big dividend yields, and assume that their spread versus Treasurys measures their market value, dividend yields, and ability to continue their high dividend payments. From this standpoint, these dividends don't seem big enough to offset the risks that they won't be paid in the climate we foresee. 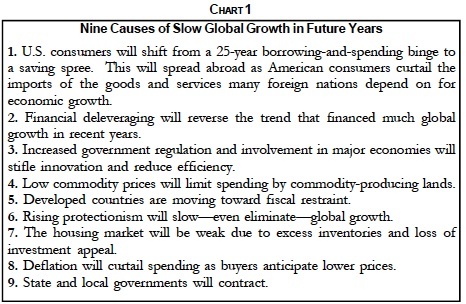 Slow economic growth robs many financially weak companies of volume expansion, and deflation kills their pricing power. If junk bond yields rise substantially, however, they then could be attractive in a world in which investors are likely to be interested in meaningful dividends of various kinds. That assumes that buyers view junk not as bonds with temptingly high interest yields, but as low-grade equities with large but risky dividends and little prospects for capital appreciation. 17. Emerging Country Bonds Are Unattractive, despite their rise of 8% last year. Like junk bonds, investor zeal for yield propelled them, and they bounced back late in the year from the European financial crisis scare last summer. Emerging country bonds and junk securities are both risky. Some bond managers who don't believe that junk yields are high enough to justify the risk have switched to emerging country debt. Are they jumping from the frying pan into the fire? Investors in emerging country bonds apparently believe in the decoupling myth that says developing countries can grow rapidly and independently from advanced lands that buy their economy-driving exports. That concept flourished before the Great Recession, died with it but was subsequently resurrected. But the recent weakness in stocks globally and in most developed and developing country currencies against the dollar are again challenging the decoupling argument. Many investors not only invested in emerging country bonds, but in the bonds denominated in local currencies, not the U.S. dollar, in the past two years in search of even higher interest returns. That pushed up currencies, to the detriment of exports, and aggravated inflation in countries such as Indonesia, Turkey, Hungary and Brazil. But with the renewed European financial crisis last summer, the dollar leaped, many of those currencies nosedived and bond investors fled. As a result, bond yields leaped in countries such as Turkey and Hungary. Expect this retreat to persist in 2012 as the global recession unfolds and, as usual, investors retreat to the safety of their home markets, which they understand best, and to the U.S. dollar and Treasurys. 18. 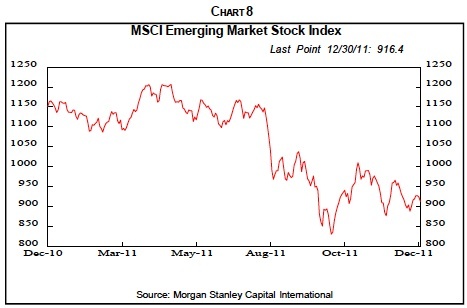 Emerging Country Stocks Remain Vulnerable after plunging in 2011. 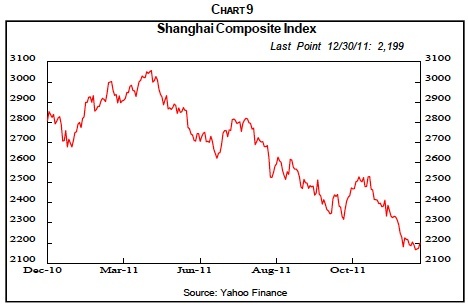 The MSCI Emerging Market Stock Index dropped 20% (Chart 8) and the Shanghai Composite itself fell 22% (Chart 9). Further substantial weakness is likely this year for two distinct reasons. First, the hard landing in China, the result of government policy restraint there and flagging exports, will knock growth back to 5% to 6% recessionary rates, as China suffered in early 2009. The effects will spread widely from the world's second largest economy and major commodity importer. Second, the likely major recession in Europe, hard landing in China and economic downturn in the U.S. will spawn global economic retreat to the extreme detriment of commodity and other export-dependent developing economies. The reality of their close coupling to the U.S. and Europe will probably be painfully obvious visible this year. 19. Commodities Will Probably Continue to Decline in 2012 as they did last year. The CRB broad commodity index was down 7%. Agricultural commodities such as sugar and cotton fell from their early 2011 peaks and declined for the year as a whole. Corn prices were about flat in 2011, but wheat and soybeans fell. Copper dropped 23%, no doubt anticipating a global decline in industrial production since copper is found in almost every manufactured good, as well as a hard landing in China, which consumes 42% of annual copper production. We doubt that the commodity price decline in 2011 fully anticipated the global recession we foresee this year, so further significant declines are probably in store, especially for industrial commodities. Copper prices are still about 85% above the marginal cost of production, so further big price declines are likely before any supply is curtailed. Agricultural commodities, of course, depend on weather. Earlier bad weather, however, did not forestall price weakness last year. And in the past, ideal growing weather often follows bad weather, and bumper crops and huge surpluses replace hand-wringing shortages in a crop year or two. We certainly hope for good weather next spring for the nectar that our honeybees turn into honey. Still, despite the lousy weather in our area last spring and devastating winter losses that forced us to replace 88 of 89 hives, we still had a decent 2011 honey crop. 20. Old Tech Capital Equipment Producers Remain Unattractive. This group is distinguished from productivity enhancers because their output is mainly used for capacity expansion, not cost-cutting. Our index, which includes makers of industrial construction and agricultural equipment, fell 6% last year (Chart 10). Further weakness this year is likely because of still-ample industrial capacity and moribund construction. Poor exports are likely due to faltering foreign economies, which is important for many of these multinationals. In this country, many expect the atmosphere of higher profits and piles of corporate cash will unleash a bonanza in capital equipment spending, reversing the ongoing decline in growth rates. Our analysis suggests otherwise. When operating rates are low, as at present, producers don't need more capacity and worry that revenues, prices, and profits won't be adequate to justify even existing capacity. 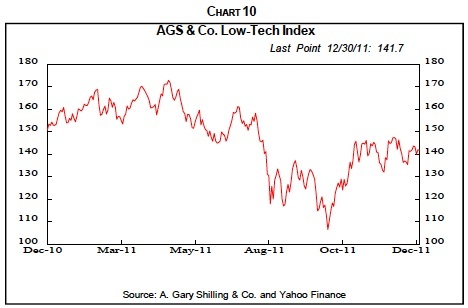 Besides the depressing effects of excess capacity, low-tech and old-tech companies suffer from other ongoing problems. Foreign competition continues to grow as their technology is transferred to China and other cheap production locales. Some suffer rising cost pressures due to lack of productivity gains. High-cost labor forces are sometimes a problem. And many sell into saturated, slow growth markets. Reliable worldwide total capacity utilization data is not available, but it clearly is in excess and getting more so in what will soon be the world's second largest economy, China. Much of China's $585 billion stimulus program in 2009 went into bank loans to finance construction of steel, cement, and power plants and other industrial capacity. How will all that capacity be utilized? In the past, it has ended up producing exports with U.S. consumers buying the lion's share, directly or indirectly. However, with American households retrenching, the viable alternative for mushrooming industrial capacity is domestic consumption in China. But China is not far enough along the road to industrialization to yet have a big middle class of discretionary spenders who can utilize all that industrial capacity. Jan. 17, 2012, 4:34 a.m. Interesting, and most of it makes investing sense. The healthcare investing theme needs a little more of a note of caution, however. As a physician, seeing 30-40 patients a day, I am starting to notice the negative effect on utilization of increasing deductibles, coinsurance and co-payments and the growing number of uninsured. A lot of business is Medicare and Medicaid and the latter, sooner or later, will face more cutbacks. I suspect Medicare will continue to grow until it bankrupts the county. Jan. 14, 2012, 7:31 p.m.
Hopefully, buying mutual funds with the proper companies will help in “the age of deleveraging.” I am disappointed that deleveraging means I should not buy a new, smaller house. Watch out for unscrupulous real estate agents who will try to get you to sell at a very low price. Two agents tried this on me, but I did not take the bait in that: to establish the price for my house, they showed low priced supposedly comparable houses that were much smaller and older than my house and not close to my house, and failed to show a high priced comparable for a smaller house behind my house. Subsequently, comparable houses like mine, near my house on my street, sold for very high prices in a depressed market. As a result and also because of deleveraging, I do not want to get involved in this very risky housing market and will stay in my 32 year old house with a paid off mortgage. Jan. 11, 2012, 12:43 p.m. I think he’s sadly mistaken about medical office space. As a physician who owns medical office AND facility space I will say that IMHO this has peaked. 1. Medicare fees have been stagnant and have not kept up with inflation for about a decade. Doctors are declaring bankruptcy (google this for all of you who still believe in the fat cat doctor myth). The survivors are going to be looking for cheaper space, not fancy new construction (expensive) space. 2. Due to declining reimbursement and increasing costs, combined with a worsening regulatory environment and the hassle of running an office (I am solo practice and have SEVEN employees just to make it work) more and more doctors are going to work for hospitals and corporations. The hospitals and corporations will build their own office space. 3. The medical facility market is saturated. Laws have been passed that essentially killed off new physician-owned hospitals. The ambulatory surgery facility market is saturated. The time for ASC building and investment was the 90s and early 00s. 4. There is an empty newly built hospital down the street from me. It was started before the crash and when it came time to roll over the note the bank declined and the thing died before construction could be completed. This was a joint venture between a major hospital system and over 100 doctors and it went under. In summary, doctors will have less money to spend on rent and the number who will be renting in the private sector is rapidly diminishing as doctors opt for employment by corporations and hospitals that have their own office space. Maybe I’m wrong but from my boots on the ground POV medical office space is radioactive. Jan. 10, 2012, 1:44 p.m.
well, i have to agree with Perrin…...we get more QE by may…maybe march….whenever DOW hits 9400 on EU blowup…..
jumped the biggest snook of my life new years day in 10,000 islands area florida….YEEEHAAAA! from one of your last ‘thoughts__’ post. secret is drink tart cherry juice, its ‘lights out for gout’ (uric acid build-up), course this is a specific incidence solution and does not change your body chemistry causing it. thats the only thing i can think of when u say you cannot metabolize alcohol. coupla ozs. alky a day is great for the vascular system. i know some drinkers that died soon after quitting-heart attack….blood thickens without alcohol…..so for gods sake PLEASE take fish oil daily to counter this. we have solutions for liver enzyme problems too. send me an email i want to help. Jan. 10, 2012, 1:31 p.m. Thanks for your work, I’m a loyal reader. The economist tends to look at inflation or deflation as a macro statistic. In the real world, it’s a micro-economic event. I don’t care what the published inflation number is…it contains a bunch of stuff that doesn’t apply to me and chances are the government is performing some sort of statistical shenanagans when they publish it. My inflation is the cost of gas, groceries and whatever specific things I buy—that inflation is going to effect my economic behavior. Jan. 10, 2012, 11:54 a.m.
No gold ? Thank you, sir, I’ll take yours…................Treasuries ? Like we can service ~100 trillion 0f debt ? What cave do you live in ?